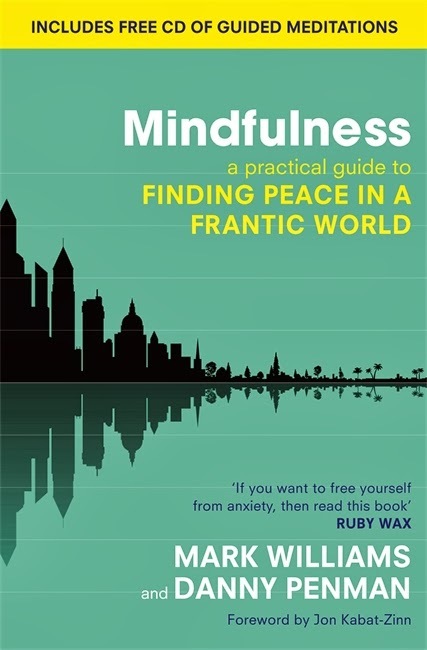 A book on mindfulness - now, this is a departure for me. I wasn't planning on reviewing this for a number of reasons, including but not exclusively because I've not finished the course of meditation it prescribes. I wasn't really planning on reading it either, but I did, also for reasons which I am not going to relate. Good stuff so far, eh? For a few years my wife has been gently suggesting that I try meditative activities to temper my tendency towards displays of extremes of emotion. I have resisted thus far because the one time I did concede ground and attended a Buddhist centre to take part in a guided meditation session, when asked how it was afterwards by a kind and gentle soul, I told him it filled me with a rage so profound that I felt I should go and stand outside so as not to hurt anyone. I did also read a book by Karen Armstrong on compassion, which had a 12-step process (instant recoil) towards a more compassionate life. I was greatly tickled and, one might say, equally upsetting to my wife as a result. However, for one reason or another, I decided that this time, I would read, absorb and practice, in whichever small way I was able, all of the guidance and exercises contained herein. On this side of the coin, I find myself uncharacteristically disinclined to find fault. Mark Williams has a simple eloquence when talking about the mind and the practice of mindfulness which I found most appealing. There is some "science", and also anecdote, and it mixes rather well, if oddly arranged in some chapters - I expected that the daily routine suggested would come neatly at the end of each chapter describing the 8-week programme, for want of a better word. Plus, the meditations did seem to work, when I actually followed what was expected. So far as my limited experience of meditation and meditation aids is concerned, this is by far and away the most accessible book that I have found. I try every day to find time to meditate, and am not unhappy to say that it's a great challenge, both in terms of time and motivation, but thus far seems to work. I am more mindful, and this has taken the edge off some of the edginess, and my rages are less frequent and always more short-lived. My wife is greatly appreciative, and so is my son, I suspect. On the flip side, and what really does boil my bunny, is that, through no fault of my own*, the edition I downloaded for my Kindle (the basic model - no fancy pants colour and wi-fi enabled shennanigans here), had enhanced content, essential enhanced content no less, which I WAS UNABLE TO ACCESS ON MY KINDLE. I therefore had to swallow a large amount of bile and stretch to another £11 for the iBooks version so I could listen to the guided meditations through my iPad. Not before posting a helpful and righteously febrile review on Amazon, those vile and wretched purveyors of human misery. God, how I hate Amazon. So, in conclusion, being mindful won't stop you hating. You'll just be aware of it and not be ashamed or self-critical. Win win I think you'll agree, and if you fancy a bit of it, BUY THE APPROPRIATE VERSION OF THIS BOOK, Goddamnit.